We tend to think of promotional Umbrellas as soley providing protection against rain and sun, as barriers against stuff that hails from above. That’s their primary function but in my opinion, a poor second to the lesser known uplift effect on a windy day. Many a walk has been made all the easier by being propelled along by a sweeping southerly! And you can help be a part of that new wave of self determined thinking – think Nike with “Just Do It” or Jeep with “Pretend No More”….these are powerful statements designed to motivate and inspire, and drummed up by very expensive AD agencies! But what’s your statement and how are you going to get it out there? Let’s take a gentle introduction to the promotional umbrella sphere with the above Mini Umbrella – it’s compact and discreet, has a wind-safe system that will help you enjoy a little uplift on gusty days, a durable rubber handle for easy grip and MASSIVE branding space! This particular advertiser used their instantly recognisable colour and logo to help reinforce their brand’s association with all the compelling reasons mentioned above. 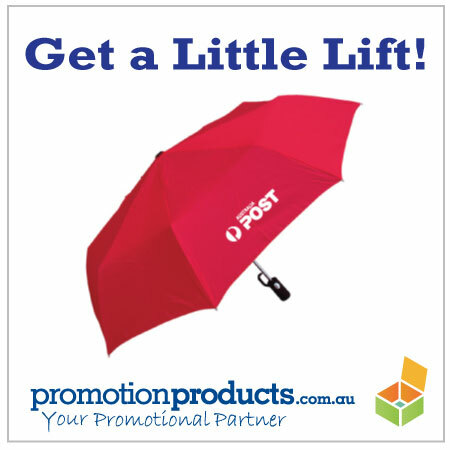 These promotional items have great function and an association with fortitude and strivance – does that in-part describe your business or sporting club? This entry was posted in Outdoor Products, Promotional Items and tagged branding, outdoors, umbrellas by admin. Bookmark the permalink.